Investors are tetchy and they’re worried. Stock markets in the US are at an all-time high, and the ASX/200 is touching two-year highs at 6000. We worry about three things. How high can the market go, when and by how much is it going to fall and what should we be doing? We asked the same questions early in 2015 as the market touched a high at 6000, and again in early 2016 as the market hit a low of 4800. The third part of that question, what should we be doing now, does not change. Many of us are loaded up with equities to different degrees and at Stockradar across most portfolios you will be about 60 invested and have a cash cushion of 40%, depending on your degree of aggressiveness. We must be able to navigate the ups and downs of the stock market with confidence and be in the optimum position no matter what the market delivers. How can we set a portfolio and manage it so we can sleep at night and not worry? Firstly the right expectations of how you are going to achieve the objective of a steady increase in equity are absolutely necessary. It will help keep your mind at ease and you’ll rarely be disappointed. Realistic expectations are the first step. Some years you will do better than others depending what the market delivers and history teaches us that there are always some very good years. The second priority is to make sure you are winning as much as you can when a stock goes up and that your capital is protected when the stock goes down. That means strict money management that entails the necessity of cutting losses and running profits and in turns this also means buying or selling when you don’t necessarily want to. That’s the tricky, but very necessary bit. The third part of the equation is belief. You must have belief in your trade plan. If that trade plan has years of history to prove itself then that’s an added benefit and confidence will become the norm but that has to develop over time. The key to taking the right approach to developing a trade plan is to understand that success comes from not ‘picking stocks’ but about managing your money. That seems sensible. If you are managing your money correctly you should never have to worry because you’re making yourself safe and that’s a choice we can make, or not. But we do worry, it’s a natural human instinct that has always driven the ups and down of the stock market. Sure we’ll lose a few but a good trade plan not only loses but it must win more that it loses. So losses are simple a fact of being involved. Managing your money properly on the stock market means exactly as I have expressed it above, make money when a stock is going up and protect it when it is going down and this is entirely isolated from knowing what the market or individual stocks are going to do because we don’t. Good stock market investors succeed because they have a plan that lets them sleep at night because they know no matter what, they are going to make money over time with a plan that has all the necessary elements that drive long term profits. That’s what I am here for, to help you understand what’s required and to understand how to build that equity. For many of you your degree of comfort in retirement depends on it. Interestingly most of the calls I get focus on losses and why they occur and of course I can’t always answer that but it does tell you something about the worry ‘psych’ of investors in general. It is what it is and all good trade plans suffer them. There should be more celebrations of wins. Let’s take the recent example of QAN for instance. A dog stock for so long that took off in 2014 and is now nearly 500% higher. That’s cause for celebration. There are some members who do call me when a big win occurs and they are the people that get it because those wins are so important and in Stockradar speak vastly outweigh the losers and that’s why the equity on the conservative balanced portfolio just keeps growing steadily. It holds QAN. In this case it had nothing to do with ‘cleverness’ it was just about taking the trade plan signals as they come up and managing the trade from a money management perspective. /wp-content/uploads/2018/03/logo.png 0 0 Stockradar /wp-content/uploads/2018/03/logo.png Stockradar2017-05-17 10:48:122017-05-17 10:48:12Are you sleeping at night? Active vs Passive – What is the skew? My recent coverage on portfolios (Stockradar Blog and the Radar Newsletter) has been an exercise in highlighting what’s on offer, the pros and cons of various approaches and perhaps what’s not on offer but should be. I have addressed many issues regarding performance against benchmarks, portfolio concentration with regard to spread of stocks, equal versus market cap weighting and the active versus passive debate. The absolute argument seems to have been left out of this debate for some reason but I’ll get to that later as today I want to discuss skewness. Trying to set an objective to cater for all the various nuances of managing a portfolio of stocks is impossible just like trying to target too many objectives for a portfolio such as out-performance or index performance, compound growth, absolute growth or trading returns and capital safety. So the two things to think about are, what are we trying to achieve, and how are we going to get there. Skewness is another variant we need to consider and it relates directly to where portfolio returns occur and why it is hard for active managers to beat an index. 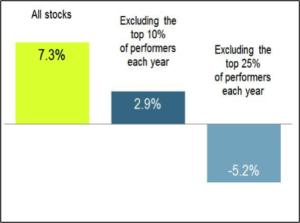 Portfolio returns are lifted by a group of outperforming stocks but are also dragged down by under-performing stocks. (No manager should be neutral on Facebook, Amazon, Netflix, Alphabet or Apple.) This would seem common sense but I wonder if investors think about this when setting portfolio trading rules. Index coverage gives market performance (minus costs), but as active managers what we want to do is bias the portfolio towards the ‘big return’ stocks and shy away from the under-performing stocks. The trick is how do you do that. stock. entry date/price. div. exit date /price. p/l. p/l%. I have reproduced Stockradar’s closed out positions for 2017 above as at the end of last week. The average return is 15.69%. You’ll note three things about this figure. One is it outperforms the ASX/200 Accumulation index which so far has returned 4.6% and secondly if you took three stocks (MIN +112%, S32 + 168% and FMG +104%) out of the equation the results would be reduced significantly towards market performance and thirdly this results profile is a normal one for Stockradar. On the other hand if you look at three poor performers from the universe of stocks Stockradar covers (but were not in our portfolios) such as AAD, TPM and MTR, they could have been a big drag on performance. As indexing covers both ‘skews’ Stockradar biases towards the big trending stocks. Obviously AAD, TPM and MTR were not trending and that’s our qualifying criteria so were out of the Stockradar portfolio. There are also other examples of stocks we didn’t hold because of that focus. For example BXB -38%, FBU -26% or TLS -20%. These three stocks were certainly a drag on any portfolio. Stockradar holds none of these but I’ll bet the big funds did especially TLS and BXB. That keeps us on the right side of the ledger and puts a drag on their returns. The big issue of minimum equity mandates restricts the fund managers enormously. You and I have the luxury of going to high levels of cash. Skewness is an obvious outcome for any group of stocks. As long as we don’t hold the bad and capture some big trends, which we must because of how our strategy works, we will always perform well against the market. In the pipeline is something I am working on and that is a new 100/30 portfolio that will leverage the focus described here. Members should watch this space for more announcements as to the release date of this new platform. Stockradar addresses both issues as best as we can. Perfection is not an objective but absolute growth is. 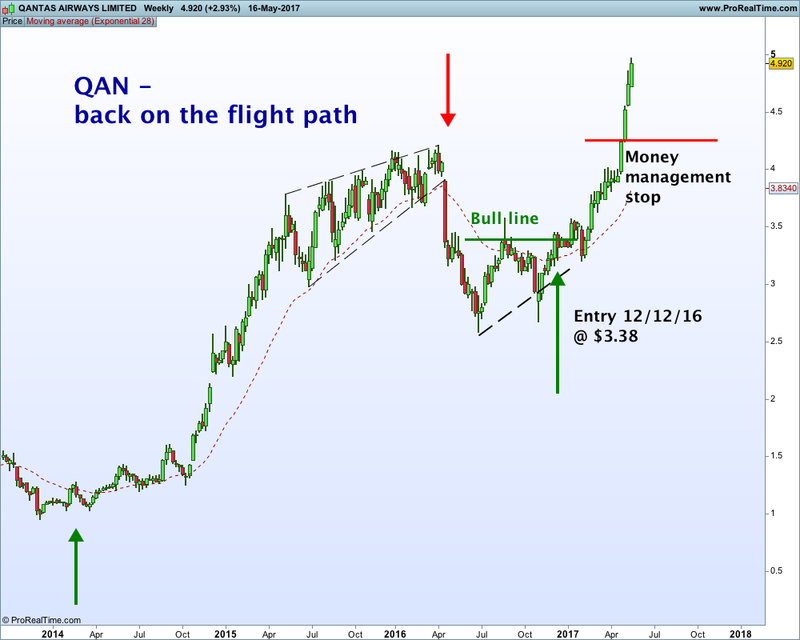 I so often see big out-performer(s) every year and note the disasters and my mind was always on that fact as I developed Stockradar’s trade plan. The disasters are diluted by using strict risk management rules and simply cutting them out of the equation. My maximum risk is always set and can be reduced or magnified by slippage, a fact of life, however it seems a good way of dealing with them. On the other side of the ledger we have the explosive movers. How best to capitalise on them? This is done by using breakout and trend analysis and being aware that trends are a constant occurrence and rarely correct more than ‘x’ amount. Thus using a trailing stop “x” distance from the price can be a good way of maximising those trends just as we did with MIN, S32 and FMG. So this helps us use the natural skewness of the market to our advantage that others cannot. But remember you have to stick with the process to make it work. This discussion on portfolio’s and active and passive management has more to it and this will be explored further in future articles. It is an important debate for you to fully understand. 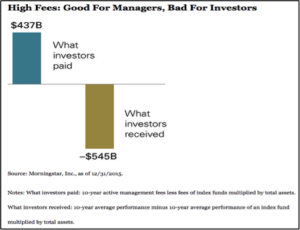 Having said that a certain type of active management can offer a better alternative and we, you and I, as retail investors are in a better position to do this than the fund manager. If nothing else we can protect ourselves against a market on the slide. But active management has to have the right objective, which is not necessarily out-performance. Remember a market that goes down 20% and a portfolio that goes down 19% is still out-performance so that is why the current outperformance objective is unnecessarily obsessed over and is unsuitable for your needs. What we want is absolute growth in a portfolio of stocks year on year regardless of market performance. Index huggers are happy now but it only takes a few weeks of untoward market behaviour to unwind the profits and make no mistake it will end painfully as it must if you are realistic. This is something that investors don’t always realise when they are winning. See link under ‘for the grey matter’ – passive investing will end in pain. Here is ‘real world’ example of skewness for you to ponder. In 2015, Facebook, Amazon, Netflix and Google, colloquially known as FANG, were responsible for all of the returns of the S&P 500. If you didn’t own or were just underweight any of those four stocks, your results probably weren’t so great. In 2016, the average S&P 500 stock returned 1.5 percentage points above the median, according to the article. And so far in 2017, the average S&P 500 stock is up 4.56%, while the median is up 4.35%. /wp-content/uploads/2018/03/logo.png 0 0 Stockradar /wp-content/uploads/2018/03/logo.png Stockradar2017-05-01 11:22:192017-05-01 11:22:19Active vs Passive - What is the skew?